Taking serious view of the state governments and High Courts’ inordinate delay in filling the vacancies of judges at all levels, which has direct bearing on speedy disposal of cases across the country, the Supreme Court has directed them to adhere to the annual appointment schedule strictly. The nationwide indefinite strike called by the State Bank of India Staff Association and Officers' Association continued for the second day today, causing inconvenience to lakhs of customers. The government has, however, ruled out to entertain their demand of enhancing pension, claiming it would lead to similar demands by staff of other banks. Is the strike by officers of the State Bank of India justified? The government today signed significant agreements with two private consortia headed by Hyderabad-based firms GVK and GMR, paving the way for modernising of the airports in Mumbai and Delhi at a cost of $1.2 billion each. The ruling Samajwadi Party in Uttar Pradesh is confident of winning the Rae Bareli Lok Sabha seat by fielding a “strong candidate” who will defeat AICC President Sonia Gandhi in the May 8 by poll. Certain important archives related to the late Prof Puran Singh, respected Punjabi poet and prose writer, seem to have disappeared from the library of Punjabi University, Patiala. When did this happen, no one knows. Looking better every year, but how? The federation (IHF) is a mere puppet in the hands of the secretary. Union Ministers Sushil Kumar Shinde and Praful Patel, senior BJP leaders, Sushma Swaraj and Arun Jaitley, and Congress spokespersons Abhishek Singhvi and Rajiv Shukla were among 27 newly-elected Rajya Sabha members from 11 states who took oath as members today. 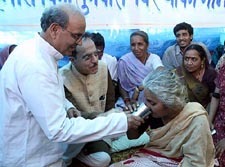 Efforts by the government to persuade Narmada Bachao Andolan (NBA) leader Medha Patkar to break her fast having failed, her condition is stated to have worsened.